To increase the efficiency of measurement operations, take a close look at the design process. Just adding tolerance information to 3D CAD models makes possible the "one-click"
generation of measurement models by "MiCAT Planner" CMM automatic measurement program generation software. What took 45 to 60 minutes with a traditional "2D diagram" manual method and 15 to 20 minutes with a "2D diagram + 3D CAD" method, can now be completed in approximately 3 minutes using MiCAT Planner. Using optimization functions, the smallest number of probe-position and tool changes and the shortest measurement path are determined by the software, and a program is generated for measurement in the minimum amount of time. By defining measurement rules using the rules editor function, you can automatically generate a measurement path conforming to those rules. This prevents quality variations between programmers. By defining measurement rules, you can automatically generate a measurement path conforming to those rules, so there are no variations between programmers. 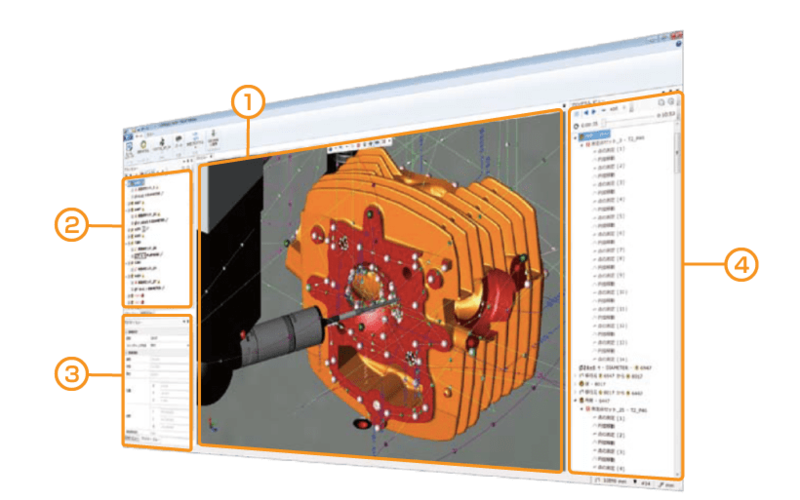 The MiCAT Planner screen configuration provides a "simple view" configuration that enables intuitive operations (3D view, plan view, etc.). You can also freely customize positioning and window size. ・Display list of measuring elements, tolerances, etc. ・The existence of measurement and evaluation can be selected using a check box. Element, tolerance, and measuring point name changes and measuring point editing can be done for each individual element. ・Display measurement details and projected measurement times. 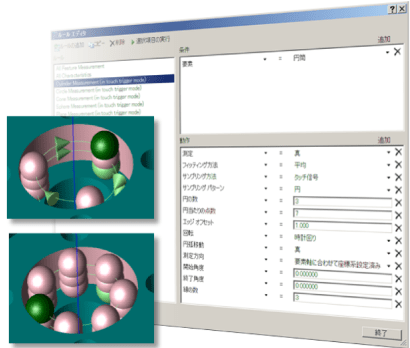 ・Using the animation function, it is possible to execute a 3D-view measurement animation. Note: The model needs to be a solid model. Assembly data not supported. MCOSMOS v4.0R5 or later*To use the measurement programs generated by MiCAT Planner, separate "Execution Rights (Run Option)" are necessary. "Execution Rights (Run Option)" for one 3D measurement device are included with MiCAT Planner.